While some Christian professionals dream of being "freed from business" to go into the ministry or see business as enemy territory to be invaded for Christ, others are convinced that Christian principles simply don't work in the "real world". 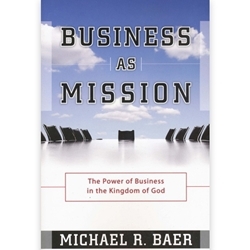 In this book, Michael Baer challenges each of these positions. He rejects the unbiblical thinking that ministry and business are by definition separate activities - that our lives can be compartmentalized into the sacred and secular. Instead he guides business leaders in developing the vital characteristics of a kingdom business - the kind of business that will free them live fully integrated lives and lead organizations that significantly impact the world.